"Out of the depths of obscurity rose Al Carapella to become the FIRST All-American in UM Football annals ! A year ago Al was just another tackle, but last Fall, the Tuckahoe, New York lad was immense at the defensive line slot. His rise was instrumental in shooting Miami's gridiron stock higher than its most loyal supporter had ever dreamed. Carapella climaxed his three years of varsity play by being named on the Associated press's mythical defensive eleven. Although the likable physical education major confined most of his efforts to stopping the opposition's backs, he also was adept at blocking and could have played on the offensive club had he not been so valuable on defense. After graduating from high school in 1945, Al served two years in the Army and entered the UM in the Fall of '47. He played on the Frosh squad as a fullback, but when Andy Gustafson arrived on the scene in the Spring of '48 there was a great need for tackles, so Al was switched up front. His first two years on the varsity, Al displayed periodic greatness, but most of the time, he was just another ballplayer. This year, he reported for practice with renewed vigor. As early as the tuneup game with Stetson, in September, it was evident that the 231 pound senior was headed for his best year. However, no one dreamed at that time that Al would be named on any All-American team. Even after the season ended and Miami had received its Orange Bowl bid, it was doubtful is any UM gridder would receive such acclaim, since the night that the AP sports editor viewed the Canes, they played most miserably in being tied by unknown Louisville. 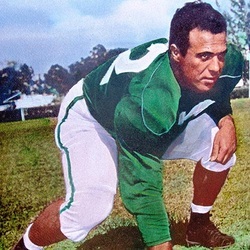 On the morning of December 6, it was announced that Al Carapella had been awarded a berth on the AP's All-American team. It took 25 years for Miami to produce an All-American, but it won't be 25 more before another Hurricane receives such an honor." Al was a 3 time letterman in football and also was a catcher on the UM baseball team. In October, 2010, he was honored as a Miami Sports Founder by the Greater Miami Chamber of Commerce.